Kris and I had a great experience this last week-end. Saturday, after the last day of school, we went on an excursion with fellow staff members to hike along a river and picnic. 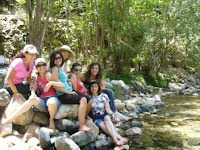 As it were, we were the on ly non-Lebanese to go on the trip. The Lebanese love to dance and eat. On the bus ride to the river we danced and so did the others. The Lebanese have a way of dancing that has a lot of hand, arm and hip motion. They like to have fun with it. There are never any partners. People dance with whomever is near them. They do have a line dance that is called the dabke. It is a simple dance, but we did not do it on this trip. When we arrived at the river we took a short hike to a beautiful spot. Even though it was a hot, humid day, the breeze coming up the river along with the cold water, made it very comfortable. 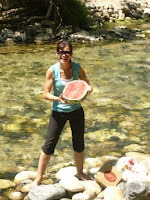 Watermelon, a bag of cherries, and cantaloupe were quickly put in the cold river to cool. The water was shallow at that point and so everyone was wading. Someone brought a boombox and played some Lebanese music. 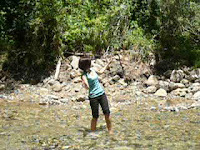 People were dancing in the river as seen in the photo and video of our friend Amira. What would a Lebanese outing be without nargileh? That's hookah, to you Stateside readers. Fadi and Nirmeen waded across the river and took a seat, filled the nargileh with river water and lit the coals. The great thing about the Lebanese is that they like to eat. We had a huge picnic that was topped off with the watermelon and cantaloupe. Tom's school year and my contract are drawing to a close, and our trip to the good old USA (or Babylon, as Cam would call it) is just a couple of weeks away. Speaking of Cam, he will be leaving Gabon where he has spent the last six months (and had malaria), and he and Ben will be meeting us in the US. Yes! Tom had another trip to Baalbek last weekend, with a group of staff from his school. It was on Sunday, and I opted to go up into the hills outside Beirut to Meeting instead (1 1/2 hours by taxi and bus; a pilgrimage). Here are some neighborhood photos. At left is a guy on Bliss St. across from the American University of Beirut (5 min. walk)making one of our favorites: a sage (pronounced "saj")--warm circle of bread filled with just about anything you want. "Cocktail" is our fav = half cheese and half thyme mixture, with added tomatoes, olives, pickles, lettuce. Below, Tom with the man who sewed him a shirt--yes, a handmade dress shirt, for less than $40. A very sweet man. He and his wife run the shop, where we have had many things altered, just down the street from our apartment. And on the right is Tom, with odd billboard, around the corner from our apartment. And the very dear lady, Sawsan, also known as Um Salim (mother of Salim), in her tiny coffee shop down the street. She has served Tom a thousand Turkish coffees and glasses of fresh-squeezed orange juice, knows my favorite kind of tea, has been incredibly patient with our stabs at speaking Arabic, offered endless sympathy, enouragment, caring and and who has become our friend . And the entrance to our apartment building (you reach inside the outer door to unlatch it), and our steadfast Turkish concierge, Mohammed, who kisses me without fail each morning and evening, three times on the cheeks, as I leave the building and return. He does usually smile! Someone reading a book of poems by a Palestinian author. It was published under the name of a Lebanese, because Palestinians in Lebanon are not allowed to own poetry—even words, apparently. Attending an education meeting in a school Beddawi Refugee Camp. 21 people, 14 of whom women, 7 scarved. No black or white board in the classroom--what do teachers write on? Nothing at all on the walls--no pictures, posters, words. I later hear they have money--why not buy things?? Schools here still operate on double shifts, despite opening of three new prefab schools, (= metal = HOT in summer!! ).